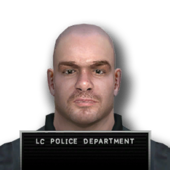 Christov Mahonvic is a criminal in Liberty City who is wanted by the LCPD for grand theft auto. He can be killed by Niko Bellic, depending on the players choice. Mahonvic has the same NPC model as a generic Russian mobster and he also bears a resemblance to lovemeet user Mark Tenninch. This page was last modified on 20 January 2014, at 13:33.